Thanks to Ian, I get to spend most of every Saturday biking. It’s the part of the week I finally don’t worry about anything harder than not getting dropped. It helps keep me sane. I ride on Saturdays rain or shine, heat or cold; the only exception is extreme wind or ice. The other exception is when I’m sick. This week wasn’t my best for health: On Tuesday I got a cold from Benji. But I spent all of Wednesday, the Fourth, lounging in bed watching Netflix (thanks, Ian! ), and by Thursday I felt much better. Friday I planned to do the usual Saturday ride, maybe albeit a little slower than usual. Then, on Friday night, I got some kind of what I suspect to be food poisoning. It wasn’t pretty for about four hours there, is all I’m going to say about that. After which I went to sleep (it was the middle of the night, naturally) and woke up feeling normal. Definitely some kind of food poisoning, but to be on the cautious side, I decided to move my ride from Saturday to Sunday. It was then decided (to use passive voice for its intended purpose, which is obscuring how/and who) that Ian would get a little mini-vacation day, while I took Benji. Thus it was that I got to see what normal people might do with a Saturday, given the whole day in which to achieve…uh…achievements. Sort through a bunch of old clothes and bag a bunch up for Goodwill. Wash a ton of dishes left from Friday night. It was a lot. Drop Ian off at the place where he was going to hang out and do some stuff by himself. Take Benji to Hillcrest Bakery for a little treat (where he ate the entirety of an enormous chocolate croissant, but only after agonizing between that and an apple fritter the size of his head). Go grocery shopping with Benji. He stuck with me most of the time, but we went by the kids’ room where there’s a super nice attendant who will watch your kids while you shop, and he wanted to go in to play. So I finished up without him. When I came back to pick him up, he said, “Oh no, it’s time to go already? 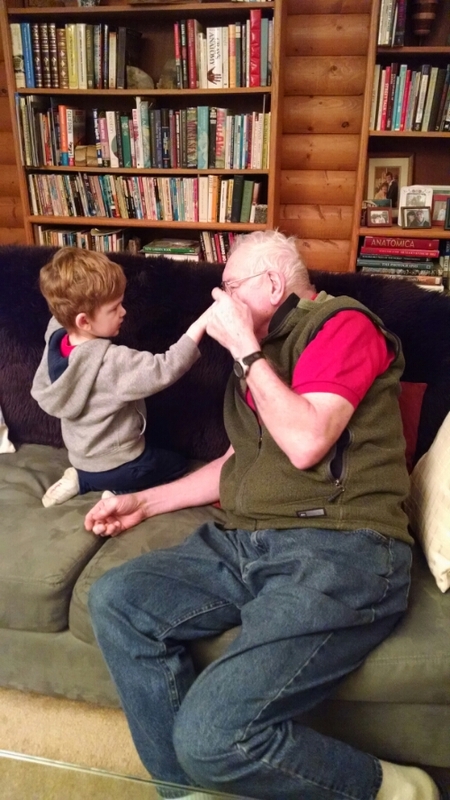 !” Then he started negotiating about when he’d get to come back. Pick up CSA veggies and do the CSA kids’ garden. Benji also found a rainbow array of glass chips in the parking lot of the CSA parking lot, which is graveled with a ton of glass chips. I don’t know where they get them, but they aren’t sharp anymore. 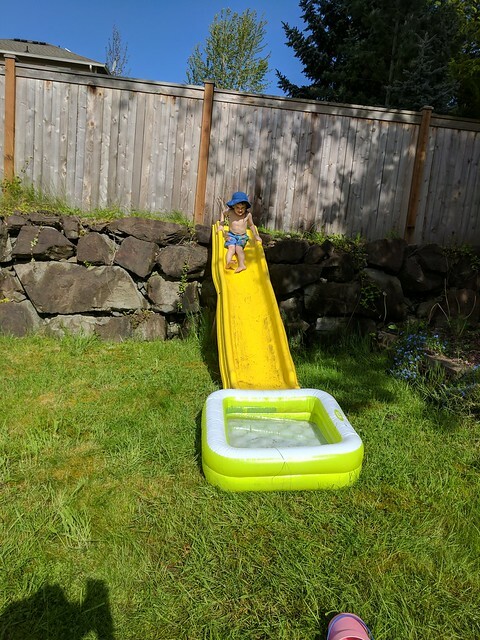 He did that, and then he picked some carrots and beets and a zucchini in the kids’ garden. Learning moments: Those squash plants are prickly! Also, to pull veggies, you need to grip at the base of the stem, near the dirt, rather than at the top of the leaves. Put away all the food and wash a bunch of the veggies (although I did save the lettuce for Ian). While also getting Benji some lunch, make two loaves of zucchini bread to use up the zucchini ASAP. To use up everything we got, I put in twice the amount of shredded zucchini, and the recipe turned out just fine–if anything, moister and more tasty than usual. Make teriyaki sauce for the first time (easy) and start marinating some meat for today’s dinner. Hope that turns out okay! During quiet time, wash dishes from the zucchini bread and eat lunch. Mow front yard… it’s really mow the weeds, as the grass has stopped growing for the summer. We don’t water and I always look forward to the grass dying so we don’t have to mow any more. I’m sure our neighbors love this strategy. Start weeding front yard. It may be dry, but that doesn’t stop the weeds from growing… and boy howdy, do they grow. There’s still a lot to do. While I was finishing that up, Ian got home from his adventures. Take Benji to Bridle Trails for a 3-mile, zucchini bread-powered hike with Grammy and Papa Gary. As a bonus, we found ripe salmonberries, huckleberries, and some tiny native blackberries. Yummy! Get leftovers together for dinner, probably the easiest part of the day. After that, Ian took Benji for a bubble bath and bedtime, and I collapsed on the couch for a couple episodes of Queer Eye (more on that another time). Apparently that’s what I can do with a whole uninterrupted day. I can definitively say that if I wasn’t gone for 4 to 6 hours every Saturday, our house and yard would look much nicer, we’d have a lot more baked goods around, and–most difficult of all–I’d be able to give Ian a better break, plus get more quality time with my child. Well, as time goes by, we keep finding a new balance for what works for us. I guess the thing about balance is you don’t just get it and you’re done. It’s a process that requires constant work and adjustment. On a bike, if you aren’t constantly making tiny tweaks (and sometimes large swerves, depending! ), you’re going to tip over. Maybe that’s also true in life. 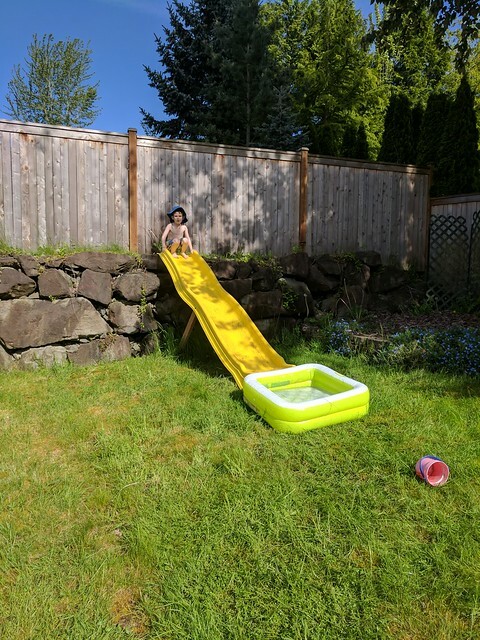 We made a water slide in our back yard over the weekend. It’s been about 9 or 10 months since we were able to play in water without getting hypothermia. 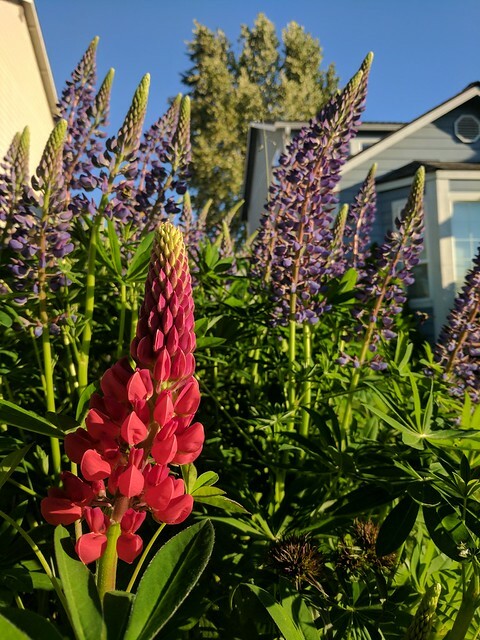 And, our lupines are doing fabulously — including a couple of genetic oddities. 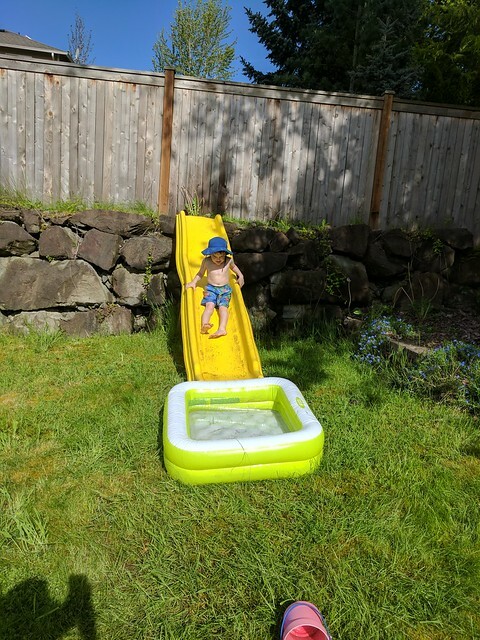 It feels so bizarre to have bare legs and arms out in the outside (or at all, for that matter) — and, naturally, I got my first sunburn on Saturday because I forgot about the existence of sunscreen. I remember now. Let’s just jump right in where we left off. I’m not mentioning much else in life because it’s going pretty normally otherwise, and this is what’s (literally) keeping me up nights. Without further ado: Bright and early this Monday morning, the heating duct guy called and told me that in another hour, his guys would arrive to install our heating duct. 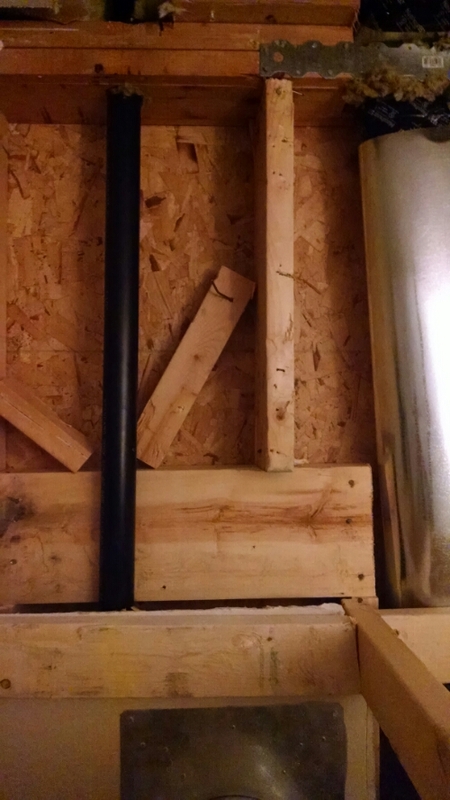 This only took them about two hours — they said it was a trivial job, even with having to replace some copper water pipes (going to our master bathroom) with… PEC? Some kind of flexible plastic tubing. They took off, and I immediately called to schedule the inspection for the next day. Tuesday I called to confirm when the inspector would come, but, very oddly, the number kept coming back as invalid. This was strange because I’d successfully called that number the previous day. So, before Benji school, Benji and I went in person to the City of Bothell to check. There we learned the inspector would come some time between 11:00 and 3:00, no telling when (this alone just about gave me an ulcer, because Benji had speech therapy until 11:00, and we wouldn’t be able to get home until 11:20 or so). We also learned that the entire phone system for that City of Bothell building was down. There’s a bunch of construction around there, and some contractor had accidentally cut their line. Ha! 1. Do a gas pressure test on the new gas line installation. 2. 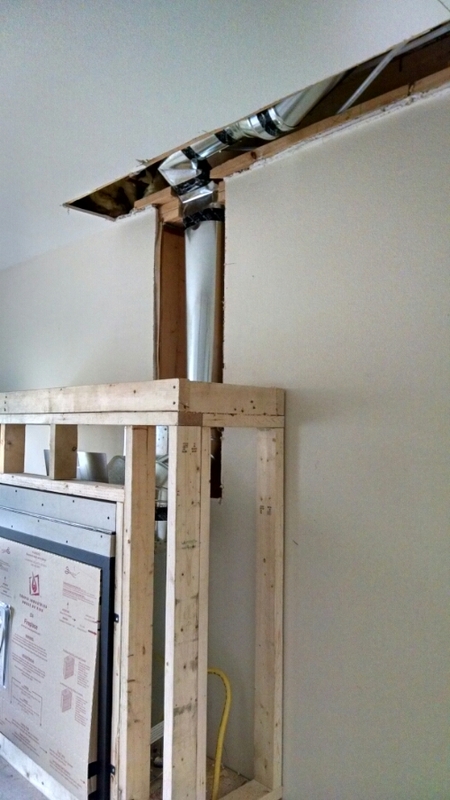 Build a box to support the stud that we cut through to vent the fireplace. Oh, and leave space so the inspector can see clearances around the vent! Number two is apparently a legit concern; you can’t have studs cut and just hanging there. Jim came this morning and fixed that…hopefully. I’m sure Jim’s work is good, but I’m skeptical of the inspector’s willingness to accept the somewhat, shall we say, creative workaround Jim implemented. All the bathroom plumbing hasn’t made this easier. Jim’s fix involved significantly widening the hole in the drywall, but oh well, it’ll give the drywall guy something to do. Anyway, finding number one is apparently a load of baloney, at least according to the folks at Kirkland Fireplace. I’m going to summarize the outcome of about a dozen phone calls in the next bit here. First, I called to set up the pressure test, and they said they could send a guy in Thursday, but no sooner. I was bummed, but we scheduled it. 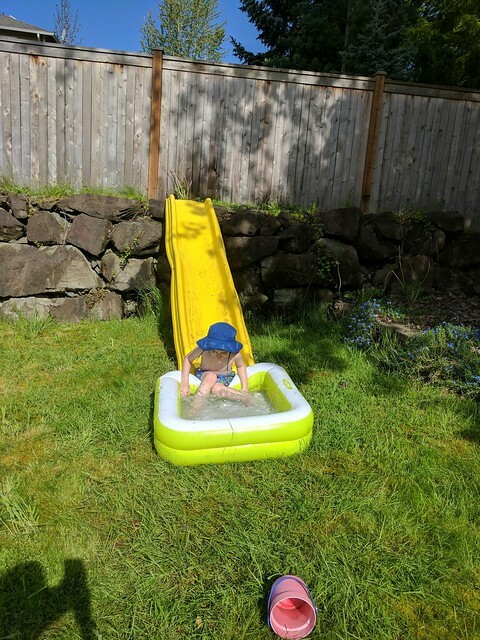 But then there was a great deal of discussion about the fact that only about two feet of flexible hose was installed — no new line at all, just hooking up to a nearby existing line, a really simple connection. 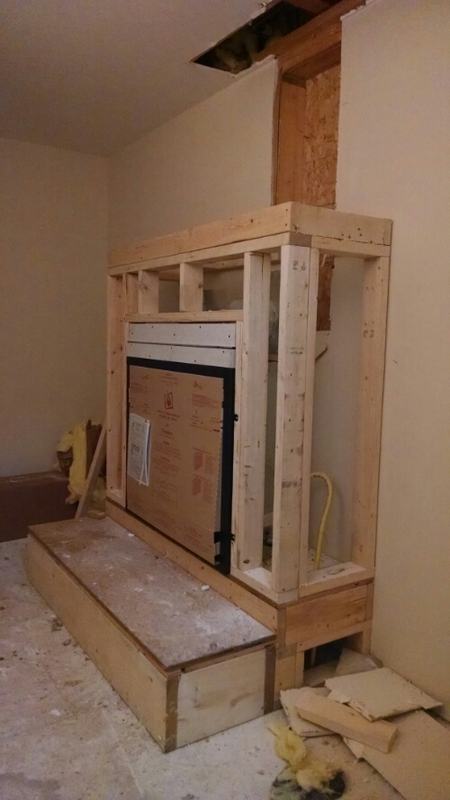 The Kirkland Fireplace guys were adamant: Code states that less than 5 feet of new line doesn’t require a pressure test. They even called the inspector and left him messages about it, but never heard back. I also called and left the inspector a message, again with no response. I imagine those inspectors are wrote busy keeping the public safe and all. Finally, after much back and forth, the Kirkland Fireplace guys spoke with the inspector (they, too, agreed that they’d met rocks with more charm). They cited the code that said the 5-foot rule; the inspector said he adhered to some other code, but if the Kirkland Fireplace guys could show him the citation in his code, and supplied a letter to that effect, he’d accept that, no pressure test required. I’m supposed to receive this letter tomorrow. The plan is that once I get this letter, I’ll schedule the next inspection for Friday morning. Assuming it passes (ah, yes, those three words do gloss over an awful lot, huh? ), the drywall will hopefully happen before Monday, and then Monday-ish the tile work starts. Frankly, that part I’m really not so fussed about; I’m eager to finish the drywall, so we can take down the plastic wall dividing our living room and keeping us from the laundry room. Now, one last story. Today, by pure miserable coincidence, our furnace stopped heating. 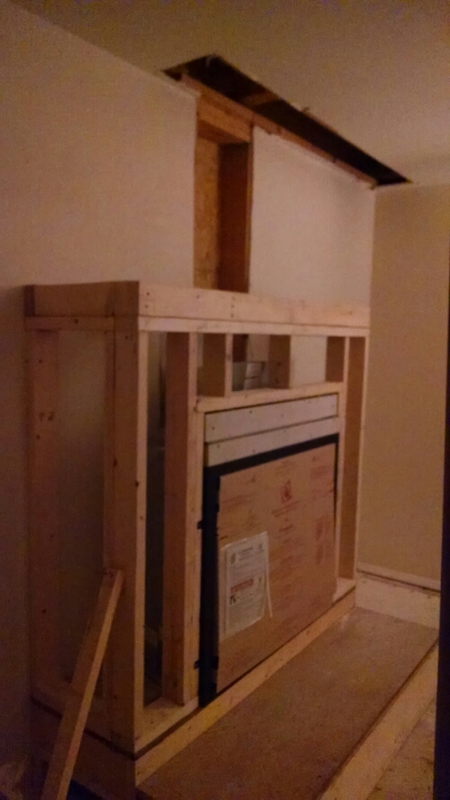 It couldn’t be related to the fireplace installation, because that was on January 26, and the furnace worked between now and then. With Gary’s assistance, I replaced the filters; we also tripped the breaker and tried flipping the shutoff on the furnace, all to no avail. Cue making another phone call this one to C.M. Heating, where they scrambled around and squeezed us into their schedule today! Meanwhile, the gears in my brain were turning, and I thought: We have a fireplace that’s all hooked up and ready to go. It can even send warm air upstairs. Why not run that for a while, and see if we can warm it up in here? So I fired it up (pun intended) and it definitely turned on; I set the blower, which should channel heat upstairs, and although it smelled a bit, everything seemed good. … Until smoke alarms upstairs started going off. During Benji’s nap. I wish I could have been a fly on the wall watching myself, wildly dashing upstairs, frantically searching for something safe to stand on so I could reach the alarms (retaining enough sanity to reject my office swivel chair, at least), then ripping the alarms off the ceiling regardless of breaking the connection (they’re wired into the house as well as having a battery), and tearing the battery out. 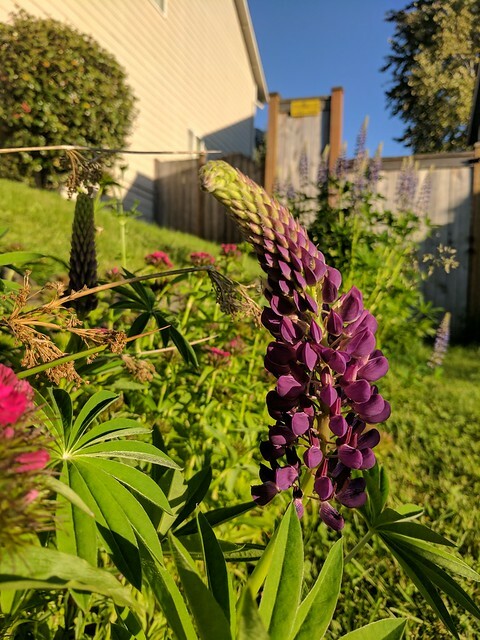 When I had finally, a short epoch later, disabled all the alarms going off upstairs, I breathed a huge sigh of relief, opened the windows to air out all the smoke, and went back downstairs… Just in time for the downstairs alarm to go off. Fortunately, this one had an easy button to silence it, but by then Benji was wide awake and already telling crib stories about the alarm going off. Needless to say, I turned the fireplace off and left the house cold inside. The fireplace smoke is normal, and I remember now the installer told me to expect smoke for the first few hours of operation. Too bad the intervening 10 days erased that little datum. 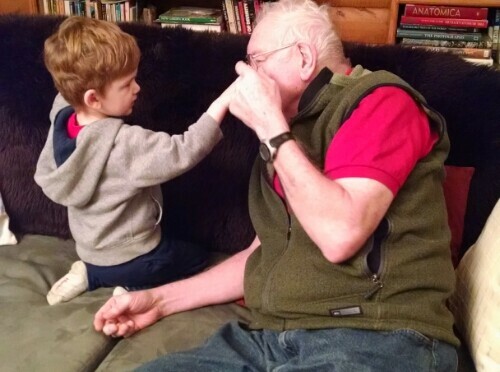 In any case, Benji and I got to spend the afternoon with great-grandparents, and when we got home, the furnace guy had already arrived and was replacing the broken igniter, so the afternoon wasn’t a total disaster. 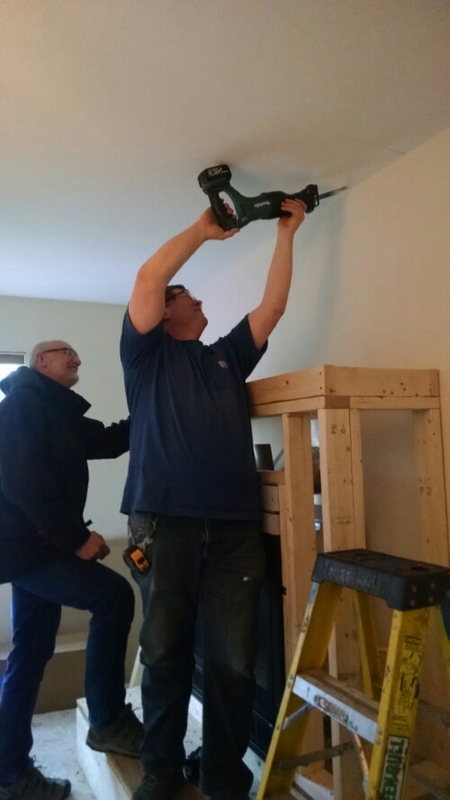 OK, our project is not exactly a well-oiled machine of closely-scheduled contractors. We’ve had many days of no work fine at all, then here and there someone shows up, does a few hours of work, and leaves again. I don’t think it’s been even eight hours of work yet, even though we started 10 days ago. 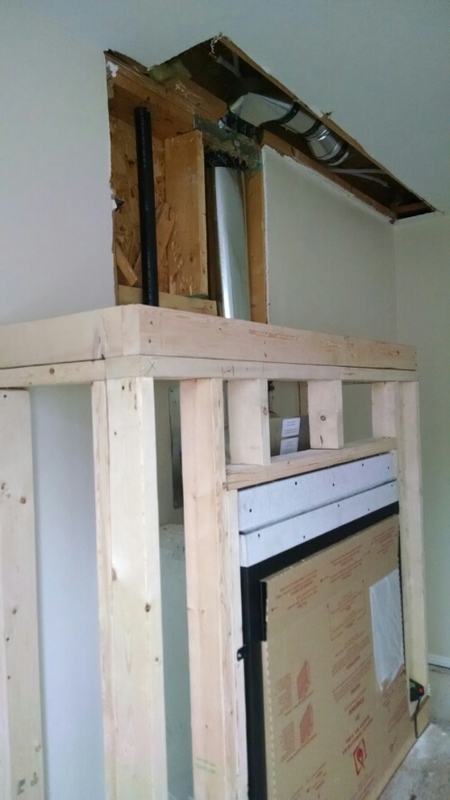 This is all right – we’re not on some tight schedule – but I’m looking forward to having interior access to our laundry room and garage back some day, hopefully sooner than later. It’s pretty inconvenient carrying all our laundry out the front door, through the garage, and into our laundry room. With all this in and out, we have a hard time remembering if the garage door is open, too, and have narrowly missed leaving it open all night several times. However, I remain grateful that we don’t have to go to a laundromat or carry our laundry long distances normally. Anyway, on Thursday afternoon “Builder Dave” and “Builder Jim” (as Benji says) came, cut some holes in the ceiling and walls, and planned how to run the heating duct to our bedroom. It’s not far, but one water pipe to our bathroom has to be shifted to the side a bit. Jim assured me it was “no big deal,” but I remain skeptical. Friday morning, Jim came over again and finished cutting the wall and ceiling for the duct to go in. 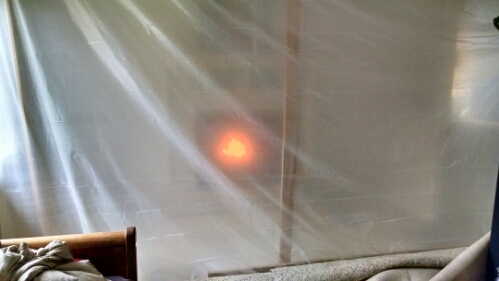 This resulted in a tremendous amount of wallboard dust, which got everywhere throughout the house despite the oh-so-convenient plastic sheeting. I cleaned up a bit in the remodel area, a possibly futile effort, but it’s still inside the house and I have to maintain some standards, right? A shop vac would be really useful, but I managed with a broom (mostly… There are still some dusty bits I couldn’t sweep). Now we’re cooling our heels waiting for the duct guys to call and tell us when they’ll come and do the work. Supposedly that’s some time today, but goodness knows when it will actually happen. After that it’s inspection time, then fixing the drywall and doing the tile. Then we clean up a bunch and breathe a sigh of relief – or, hopefully in my case, finally sleep soundly again.